eCivis is a cloud-based grant management system designed to streamline compliance and centralize the grant activities of local, state, and tribal government. 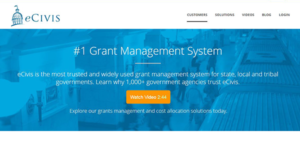 It is a comprehensive solution that empowers government entities with the right tools to help them manage the end-to-end grants pursuance process. The platform enables users to reduce audit findings, increase funding, and improve their performance to develop the community they serve. eCivis consolidates the entire grant lifecycle management to eliminate the numerous systems and steps needed to secure funding for projects. The application facilitates the successful pursuit, winning, and administration of grant funding with a goal to make projects that matter to users become a reality. Some of its core features include grant research, training management, grant award tracking, collaboration tools, goals tracking, and project planning. eCivis is a reliable SaaS solution which means it’s easy to implement and support. The application allows administrators to configure advanced features on the fly as their business needs grow. It eliminates hardware provisioning, software complexity, customization work needed to implement, and the costly & time-consuming program services. Its upgrades, maintenance, and system administration are done in the cloud and normally take place automatically and frequently, thereby eliminating the over dependency on IT departments. eCivis is a highly customizable solution designed to add standardization across your organization. It’s a robust system that drives transparency while enabling you to generate timely and accurate reports. This helps you comply with all the grant requirements and streamline your processes for faster return on investment. Information sharing and collaboration simplify the grants management process and spur users to improve organizational performance. eCivis provides a scalable and innovative platform that enables sub-recipients, funders, and applicants to collaborate effectively. It offers all the tools needed to improve information sharing to eliminate duplicative effort and consequently reduce the administrative costs. Proper information sharing eliminates the administrative burden and allow users to overcome complex systems that limit reporting to both external and internal stakeholders. If you are interested in eCivis it may also be a good idea to analyze other subcategories of Best Grant Management Software collected in our base of B2B software reviews. There are popular and widely used solutions in each software category. But are they essentially the best fit for your enterprise’s specific requirements? A market-leading software application may have thousands of users, but does it offer what you require? For this reason, do not blindly spend on popular systems. Read at least a few eCivis reviews and consider the aspects that you want in the software such as the fees, main features, available integrations etc. Then, choose a few systems that fit your wants. Check out the free trials of these products, read online opinions, get explanations from the vendor, and do your investigation systematically. This profound research is sure to aid you select the finest software application for your firm’s specific needs. How Much Does eCivis Cost? We realize that when you make a decision to buy Grant Management Software it’s important not only to see how experts evaluate it in their reviews, but also to find out if the real people and companies that buy it are actually satisfied with the product. That’s why we’ve created our behavior-based Customer Satisfaction Algorithm™ that gathers customer reviews, comments and eCivis reviews across a wide range of social media sites. The data is then presented in an easy to digest form showing how many people had positive and negative experience with eCivis. With that information at hand you should be equipped to make an informed buying decision that you won’t regret. What are eCivis pricing details? What integrations are available for eCivis? If you need more information about eCivis or you simply have a question let us know what you need and we’ll forward your request directly to the vendor.